Hanuman Jayanti 2019 date based on Hindu Calendar - India Standard Time. Hanuman Jayanthi is the birthday of Lord Hanuman and it is observed on the full moon (Purnima) day in the Hindu month of Chaitra (March – April) as per traditional lunar Hindu calendar. In 2019, the date of Hanuman Jayanthi is Friday, April 19. Lord Hanuman is also known as Bajrang Bali and Anjaneya and is one of the most popular gods in Hinduism. He is a Chiranjeevi – one blessed with immortality. In Orissa, Hanuman Jayanti is observed during Vishuba Sankranti (April 15). Hanuman Jayanti is also observed some communities during Diwali (October 26, 2019). This is observed on the previous day of Diwali. You can read more about this Hanuman Puja here. In Karnataka - Another popular day dedicated to Hanuman is the Hanumantha Vrata observed in Margashirsh month (November - December) in Karnataka and parts of Andhra Pradesh and Telangana. This is on December 10, 2019. In Tamil Nadu, Hanuman Jayanti is observed during the Margazhi month (December – January) (January 5, 2019, as per Tamil panchangam) Read more about it here in this article. Lord Hanuman symbolizes strength and unparalleled devotion and selfless service. He is the greatest devotee of Lord Ram and he is a Brahmachari (celibate) and humility is his hallmark. Lord Ram said to Hanuman, ‘I am greatly indebted to you, O mighty hero. You did marvelous, superhuman deeds. You do not want anything in return. … you have not asked for anything at any time. You threw away the precious garland of pearls given to you by Sita. How can I repay my debt of gratitude to you? I will always remain deeply indebted to you. Devotees chant Hanuman Chalisa and Hanuman Ashtak on the day. Most Hindu devotees also fast on the day or on the previous day. In today’s society of convulsions, inertia, selfishness, moral and social, spiritual and ethical decay, Lord Hanuman has become the standard bearer and the embodiment of courage, self-control, power, selfless service, bravery, integrity and humility. Hanuman is Immortal – without death. Bhagavan Sri Ram granted him the boon that he will live as long as the story of Sri Ram is remembered in the world. 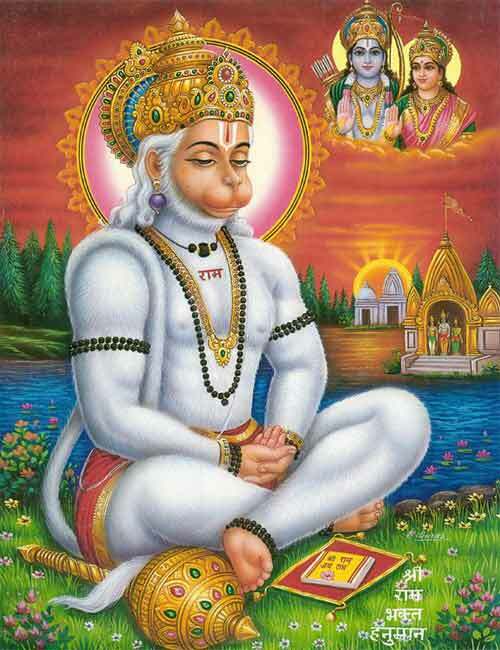 Hanuman is present in all those places where the story of Bhagwan Ram is read or narrated. How to observe Hanuman Jayanti? Hindu Blog has more than 200 articles dedicated to Hanuman and you can read all of them here.